HÀ NỘI - Chairman of the Hà Nội People’s Committee, Nguyễn Đức Chung, has said Hà Nội is installing four high capacity oxygen supply systems at West Lake to improve the lake’s oxygen content. The four systems are expected to provide a high volume of more than 300,000 cubic metres of oxygen per day to the lake, the city official said. 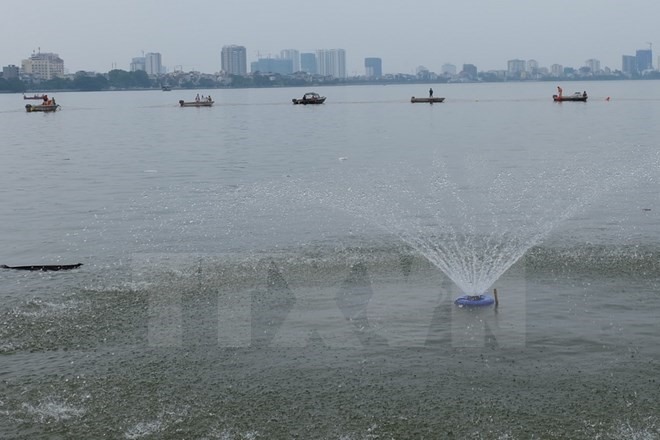 After five hours of operation, one of the systems installed on Thanh Niên Road, which surrounds part of the lake, had helped increase the oxygen level from 0.1 to 0.5 mg per litre, according to a report from the committee yesterday. The oxygen content in water areas around the 500 metre-long system has also been improved, with the highest saturation levels reaching between 6 and 8mg/litre. Such oxygen increases were ensuring healthy conditions for all species of fish living in the lake, the report noted. The installation of the four systems was undertaken by the Phú Điền Construction Investment and Trading Joint Stock Company. Aside from the four systems, the Hà Nội People’s Committee said the city also planned to install one more oxygen system in Trúc Bạch Lake near West Lake. Oxygen depletion was allegedly responsible for killing tonnes of fish in West Lake since October 1 in Hà Nội. Experts said algae blooms in the hot weather, and water pollution caused by household wastewater discharged into the lake, were suspected of being the cause of the fish deaths.